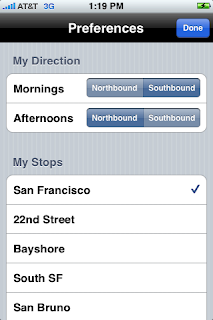 Update: My Caltrain has been updated an re-issued by Wendy Ju as CaltrainSchedule. Enjoy! 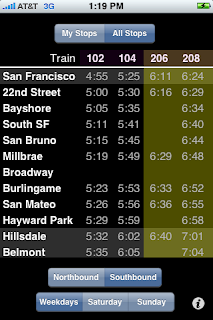 For riders of the San Francisco peninsula Caltrain: a new iPhone app to show the upcoming times of trains at your stations. 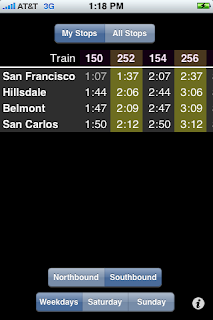 You tell it the stations you're interested in and the directions that you usually travel and the next time you start it you'll see upcoming scheduled train times customized for you with no more clicking. Bullet and express trains are highlighted and the full time table for the whole week and weekend can be browsed without connecting to the internet. Available from the iTunes app store. This is version one, if you find any problems or have requests for it to do something it doesn't then email me and I'll see if I can get it in the next update. Updated for March 2nd Schedule Change - This will appear as a free update to existing users.